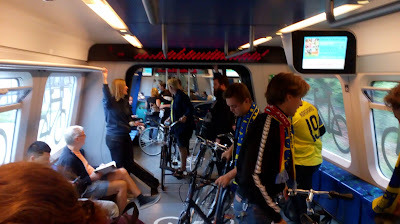 A couple of weeks ago, I wrote about my trip from the suburbs of Copenhagen. 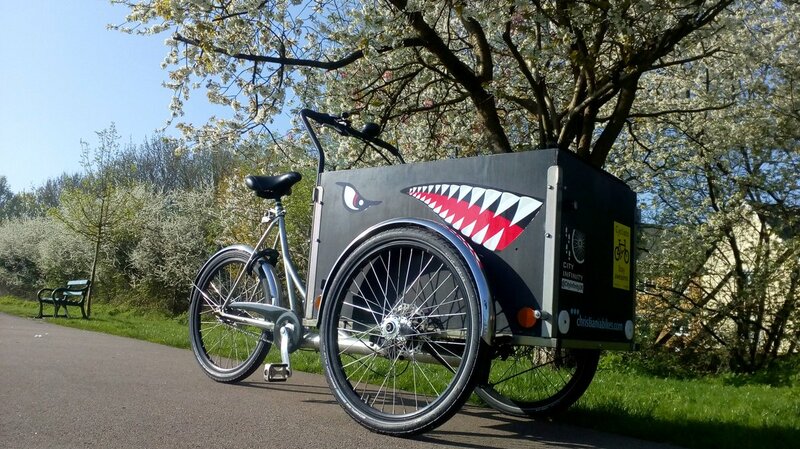 This week, I pick up on some of what I saw around the city centre. 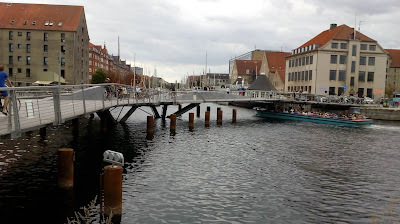 Copenhagen has lots of bridges - having islands and waterways makes them an absolute necessity. What is very nice to see is the bridges dedicated to walking and cycling. 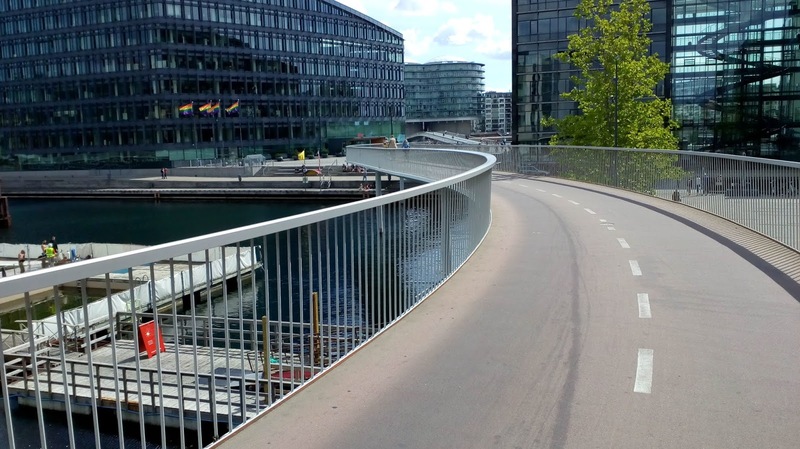 To the south of the city, we have the famous Bicycle Snake (Cykelslangen) which provides part of a link route across the harbour connecting the main part of the city with the island of Amager (on which Copenhagen Airport can be found). 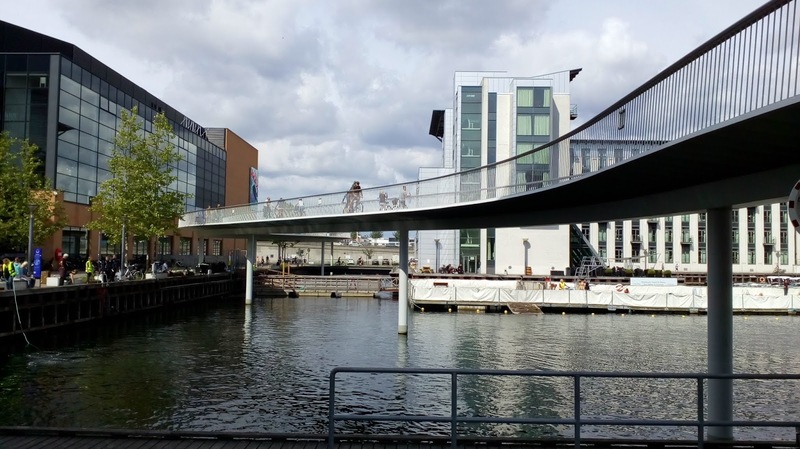 The north end of the bridge starts next to the Fisketorvet shopping mall (below) and yes, snakes across part of the old docks. For people on foot, the provision is nowhere near as iconic and you need to use steps to get down to dockside level or find you way through the shopping centre to a lift. As we've come accustomed to, the levels are kept flat and so the Danish-fillet makes its usual appearance rather than dropped kerbs for vehicles, cycles and people walking alike (above). The fillets are everywhere and when people need to cross the road on foot or by cycle, they usually need to be mindful of the bump. Bridges feature here such as the Butterfly Bridge which is a 3-armed lifting bridge for walking and cycling. Just west of the Butterfly Bridge, we have the Inner Harbour Bridge (Inderhavnsbroen), which is also known as the Kissing Bridge, which has been plagued by technical problems with its opening mechanism. The central span of the bridge splits into two at the centre and the two parts slide backwards to let shipping through - a video of it by Cezary Marek can be watched here. The shape of the route across created by the gap into which the opening parts slide into means that there are dog-legs in the cycle route which are reinforced by red and white barriers to highlight the kinks - it's a bit awkward. 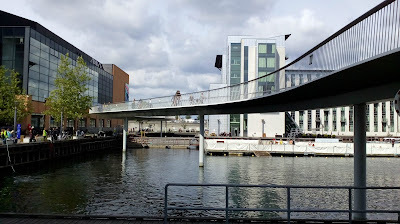 The bridge landing at its western end is into a shared area and then a local street which I found to be quite conflicted. 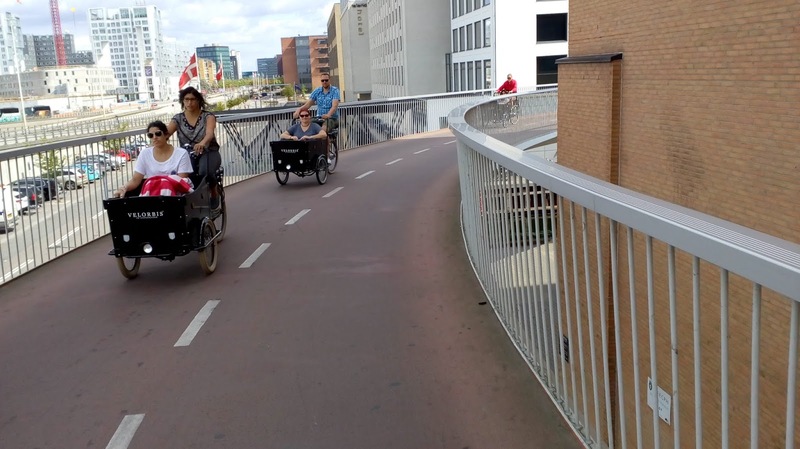 After my little look at some of the new bridges, I simply rode around the city for a few hours taking in the sights and absorbing the different types of cycling infrastructure. 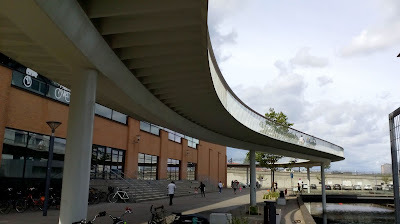 Above shows some of the most basic provision over a large bridge (Langebro). In the UK, this would probably be a shared bus lane, but here at least, there is a bus lane to the left and so even though the protection is just paint, the wide cycle lane is also buffered from general traffic. 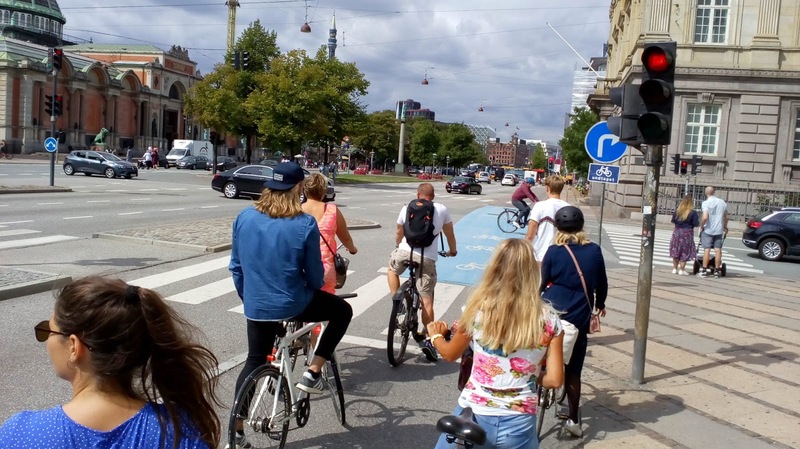 Just north of the bridge and we are on Hans Christian Andersens Bouelvard approaching the junction with Rysensteensgade. Here, cycle traffic gets a signal with right turning drivers being held which was a little unusual for the city. The ahead movement going into a service road. 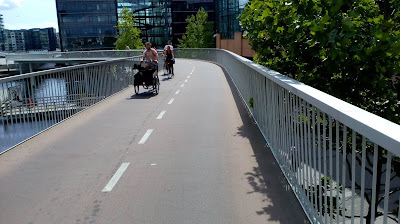 Above is Niels Brocks Gade which seems to have recently been provided with cycle tracks. I can't quite remember all of the locations, but on the main roads, the cycle network continued, even where space was tight and it was clear that quite a bit of car parking had been removed otherwise there wouldn't have been space (above), although in many places, parking remained available (below). In many parts of the city, choices dictate the layout. 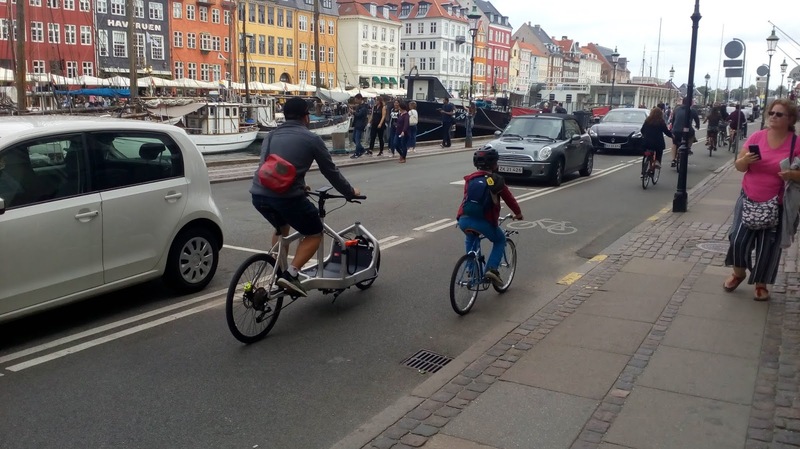 Below is Nyhavn which is within a self-contained area which avoids through-traffic within a filtered area of one-way streets. Contraflow cycling is provided by a parking-protected cycle lane. 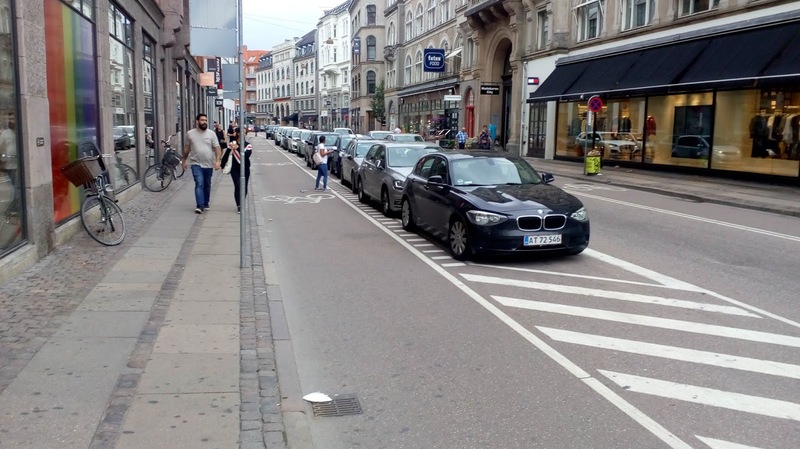 Below is another example of a parking-protected lane. The width of the lane means that dooring is possible, but probably unlikely. In the city centre, there are bus stops where the cycle track passes through the boarding area (below). 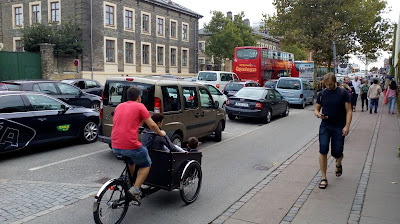 The general principle is that people cycling should stop where they see a bus pulling in. It's not a great layout to be honest and it's a symptom of the space arrangements. The example below is a little better as the cycle track is much wider and so there is more space for people to avoid each other. One layout which I am really not a fan of is the merging right turn (below). People cycling have their cycle track end as they drop into the carriageway where the space accessible to drivers turning right. You'll note the kerb line on the right opens out and the theory is it encourages people cycling to take primary position (below), but it is really very uncomfortable, even where is was quiet. 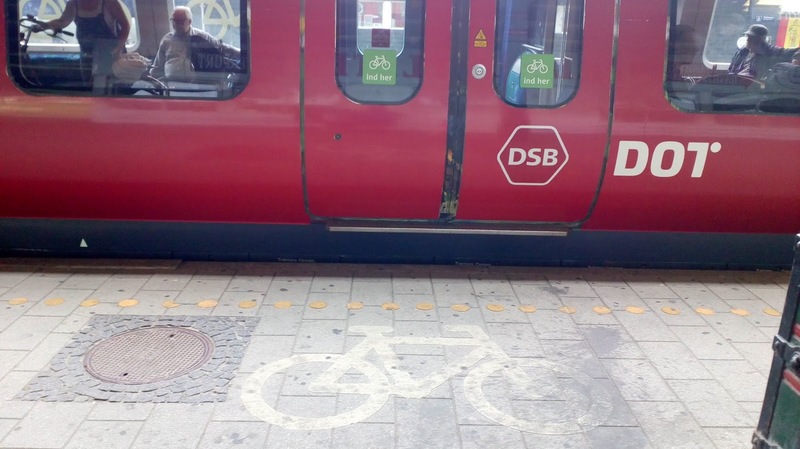 It kind of works because drivers generally obey the rules; however, I'd be more concerned about the cyclists arriving late in the green and perhaps at night or in the rain. 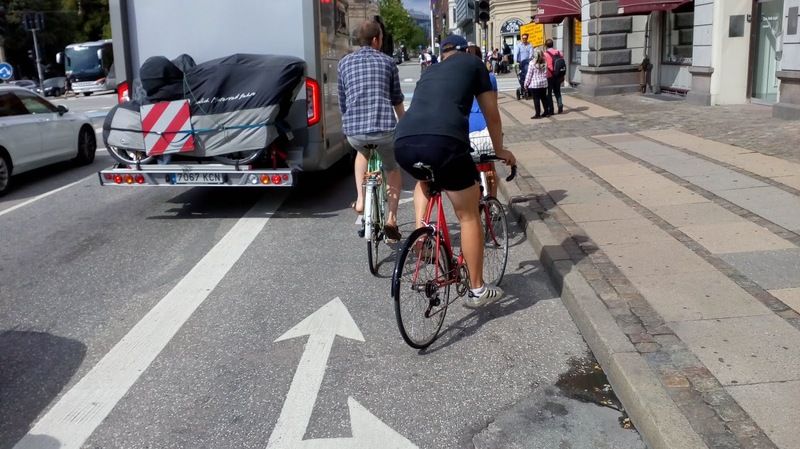 Even with the simple signalling arrangements, there is also a lack of protection from right turning drivers - even a simple island would force right turning drivers to cross people cycling ahead to cross the line of walking and cycling perpendicularly. Above is an example of some cycling directional signage which is clear and helpfully provides time and distance information. In the flat city centre, I personally found the times to be very helpful. The layout shown above was one of the nicest I found (for a main road) because there was a planted buffer from the traffic lane. 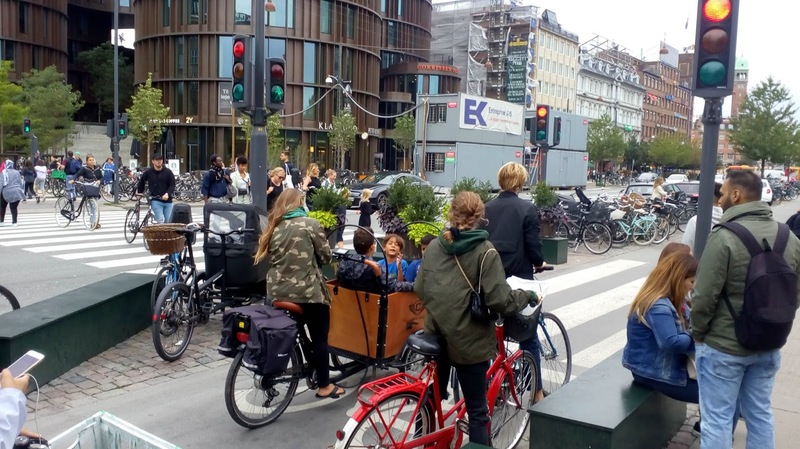 Copenhagen isn't all cycle tracks - there are plenty of pedestrianised areas within which one can cycle, but unfortunately, there seemed to be rather too much motor traffic access, even though there are many areas filtered with one-way systems (2-way for cycling) such as Kompagnistræde (above). 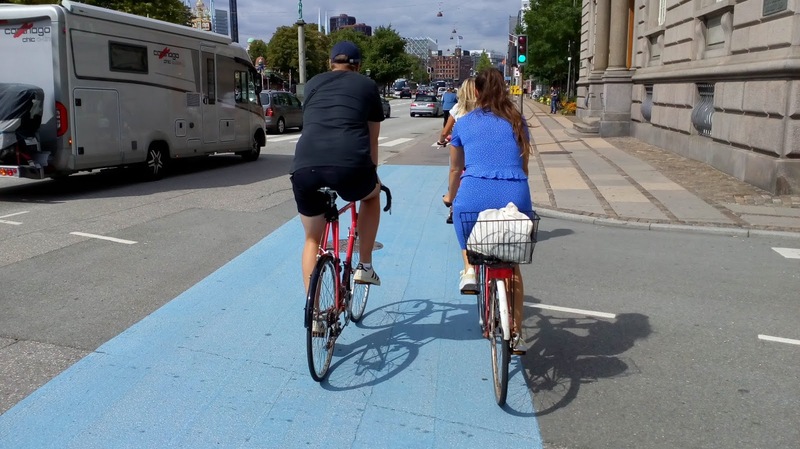 There are some useful clues on how the city added its cycle tracks - make no mistake, many are retrofits rather than new-builds; a process which continues today. 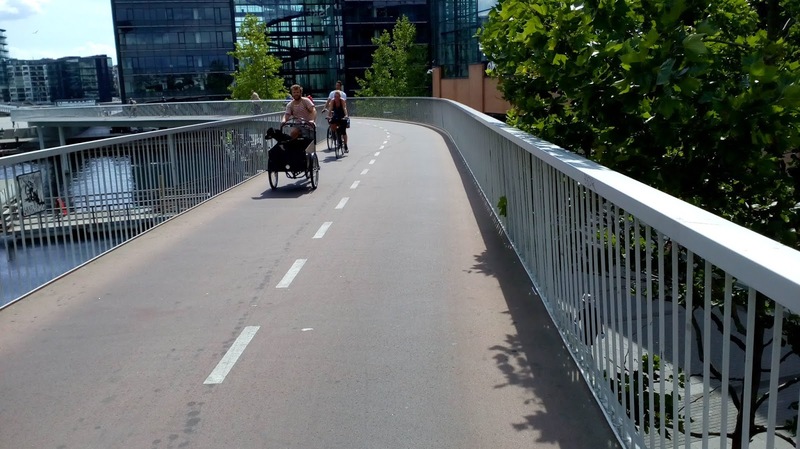 Above shows a double gulley system whereby the kerb between the cycle track and the carriageway picks out a former (probably parking) lane and uses the same crossfall, hence an additional gulley on the nearside of the cycle track. 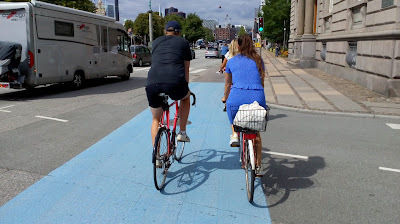 Above is another familiar site in the city - blue paint; it's there to encourage people to take priority from turning drivers and to remind turning drivers that people cycling have priority. Of course, it has no magical abilities to protect - this is down to drivers obeying the rules. The photo above shows what happens when drivers don't understand the rules and turn across people cycling. As I said in my last post, Copenhagen is a cargocycle town and it you don't need to look hard to find them being used (above and below). 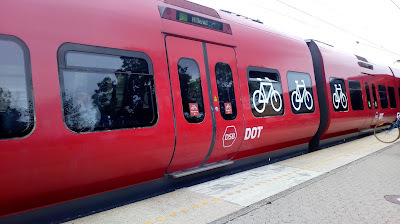 One final piece of cycling infrastructure is the train network. Train-specific sections which are arranged that you take your cycle on one set of doors and out of the other for efficiency. 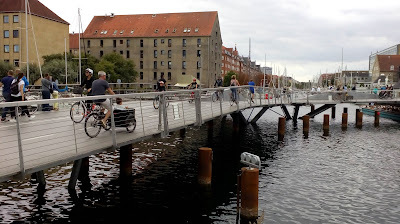 Copenhagen has a wonderful cycling network. 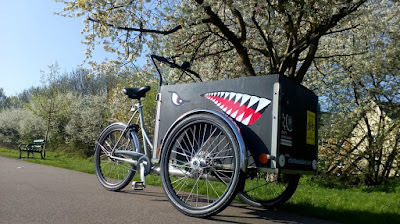 It is easy to get around by cycle and the fact that there is a city-wide network means that cycling mode share it high. 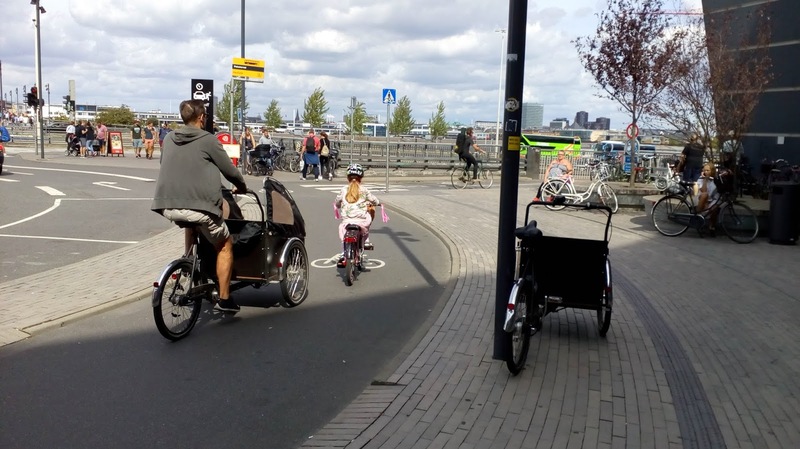 However, it is also easy to drive into the city and couple with the compromises at the signalised junctions, a great deal of work is needed to get up to the Dutch quality for cycling. I think I may have video, I still haven't sorted through everything from that trip.